That the Japanese are open to cryptocurrencies and similar blockchain technologies but concurrently stringent protecting investors is true. So tight are applicable laws that investors who lose their digital assets are guaranteed of a recourse. We have seen that happen with the ongoing Mt Gox Civil Rehabilitation Case. Because it is mandatory for exchanges to register with the country’s Financial Services Agency (FSA), investors are safe. Now, under the fund settlement law of which crypto exchanges must follow since they are platforms for buying and selling digital assets, wallet service providers are exempt. It is understandable, simply because most are platforms where users register for free. From there, they can safely manage their digital assets. But the FSA want to spread their wings and ensure that in case of a failure or the platform swindle their customers by draining all their assets then law and order must prevail. Then again, even if they these wallet providers are not actively buying and selling coins, they do manage payments. To this end the FSA plans to formulate fitting regulations in line with the international standards for preventing money laundering and terrorism financing set by the Financial Action Task Force (FATF). Possible measures might include internal controls, separate account management of wallet provider funds and customers’, financial statement audit and publication of policies indicating path of recourse should hacks happen. 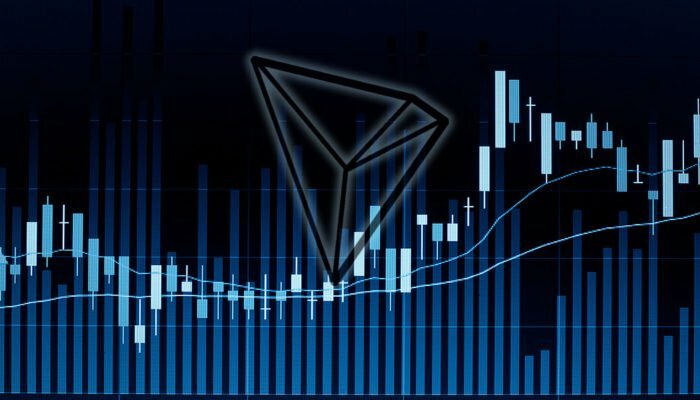 Perched at 11th, TRX/USD is down 17 percent in the last week. However, in this time frame TRX bears are yet to breach and close below key support levels. 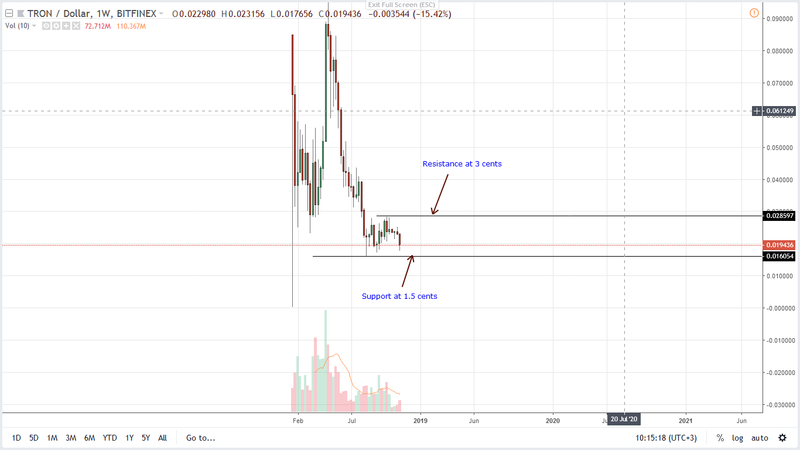 As such, our previous conservative TRX/USD trade conditions are not live though there are clear rejection of higher highs from the all-important 3 cents buy trigger and resistance line. From a top-down approach it is clear that the path of least resistance is southwards and with every low, chances of early August bear breakout pattern is likely to be confirmed. As reiterated before, conservative traders should initiate shorts once there are clean breaks below Sep lows at the 1.5 cents double bottoms. Ideally, this break below should be accompanied by high trade volumes with first targets at Jan 24 lows and stops at the bear bar preferably at 1.5 cents. 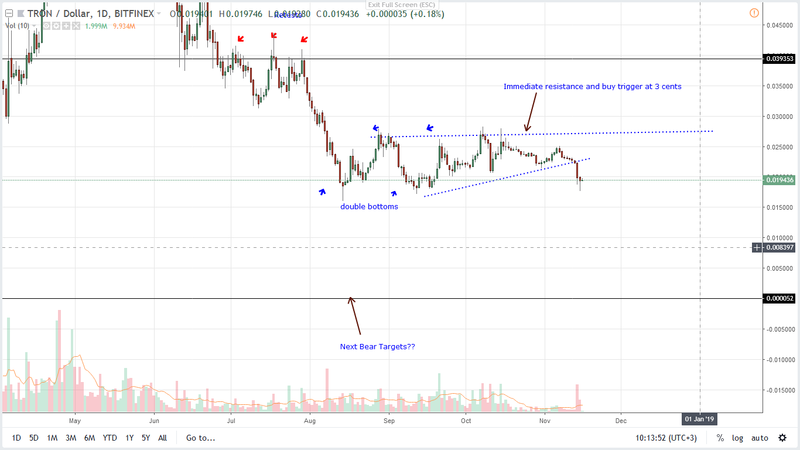 From our previous TRX/USD trade plan, we had mentioned how important it was for bulls to close above 3 cents resistance level nullifying the bear attempts of early August now that prices were trading 90 percent from 2017 highs. But, with relentless sellers trading within a bear flag, the close below the minor support trend line on Nov 14 all printing out with strong volumes—49m from average of 9 million. Because we now have a whole bar below the support trend line, we suggest aggressive traders to sell at spot prices with stops at 2.3 cents with first targets at Aug lows at 1.5 cents. Further losses then ideal bear targets would be as aforementioned at Jan 24 lows.